You have a stepper motor and you are wondering how to wire it to your driver board. If you have a four lead motor, then that is plenty easy. But what if the motor has five, six or even eight wires? What can you do with them? In this article I do not detail how to determine which phase is which as I have covered that topic on a different posting. What I want to discuss are the implications of wiring your motors one way or another. Another? Is there more than one way? In some cases yes! So lets take a looksie, shall we? There is not much detailing here. 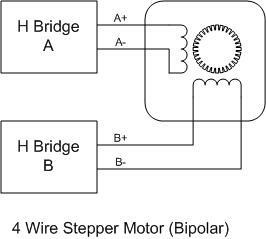 The four wire stepper denotes a single possible configuration and that is of a bipolar stepper motor. We do not need to bore us with details such as whether this motor is variably reluctance, permanent magnet or hybrid as that only relates to construction. What we need to realize is that two wires are for PHASE A and the other two wires are for PHASE B. Which one is PHASE A and which one is PHASE B is kind of arbitrary. If you have the motor datasheet then you know which wires represent which. But if you do not have this document, just do a quick continuity test and determine which two wires are connected together through an inductor. You can also use a simple BACK EMF test in which you short two leads together. If it is harder to move the rotor, then those two wires form one of the phases. If the rotor moves as easy as with no wires crossed over, then those two wires are not connected through a winding. Keep on going until you find both phases. Once you have determined both phases, you can wire your motor as shown on the picture above. If you do not know which one of the phases is A and which one is B, just wire the motor until you get the direction you want. But how do we learn which the center tap is? Chances are you will not have the documentation for this motor. If this is the case, then you will need to do a quick resistance measurement. You will find that a winding to center tap measurement will be either half or a quarter the measurement from a winding to winding measurement. The problem with this motor, however, is that you do need to get the order of the phases correct or you will not be able to step it correctly. What I prefer to do is rotate the rotor while looking at each winding output with an oscilloscope. You will then get the right sequencing order. OK, now we can follow with the truly messy stuff. 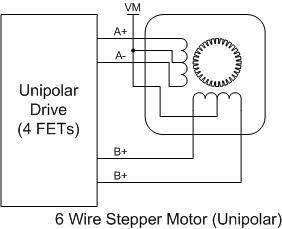 A six wire stepper wired as unipolar is a no brainer. Wiring it as a bipolar, however, can get tricky. Not because it is hard, but because it depends on what you want to do. To wire as bipolar we will ignore one of the winding connections, either the center tap, or one of the sides. Both methods will have different implications; that is advantages and disadvantages. I portray below both implementations and then we can see what kind of goodies and damage we are dealing with. When we ignore the center tap, we get an inductance of 4L as seen on FIGURE 4. This may seem like just a trivial conclussion but the implications are massive. What this means is the current will take four times as long to increase through the magnetic field. Hence, it is safe to assume the magnetic field will also take four times as long to build up and cause motion. If you arae thinking this will increase the trouble of moving the stepper faster and faster, then you are correct. What happens is that as the stepping rate is increased, a new step is issued long before the current step can take place. In mechanical terms, the rotor starts to lag the revolving magnetic field and eventually it falls behind with the motor stalling and losing synchronization. In other words, precisely what you don’t want. What is the solution? There are only two things I can think of. Either you increase the voltage, which increases the rate at which the current charging through the winding goes up, or decrease the inductance. Before I go into the inductance, let me state that increasing the voltage is an excellent idea if you can. 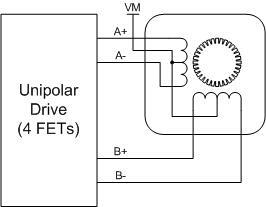 However do note that stepper drivers have a maximum voltage associated with them. You may also have very little flexibility on the power supply voltage, in which case this discussion is over long before it started. Hence, decreasing the inductance is the only way. If you can get a stepper designed with lower inductance, then awesome! If not, you can always resort to the left side of FIGURE 5. Notice we have ignored one of the winding sides instead of the center tap. What does this buys us? Well, for one now your inductance is equal to L, instead of 4L as shown on FIGURE 4, which means the rate of current change is quadrupled from the center tap version. As a result, you should easily see the maximum speed increasing accordingly. There is one caveat, however. Perhaps you noticed that as we eliminate half of the winding per phase we are hindering the amount of torque the motor can put out. After all, half of the copper on the motor is not being used and if the current is being regulated to the same value, we should expect half of the available torque present. Like I stated before, you can either get torque or speed, hardly both. When you eliminate the half winding the motor will be able to move faster but only as long as the torque constraints are met. That will of course depend on the application. After so much discussion on tips and tricks, the reader may feel intrigued about one connection style we have not discussed. 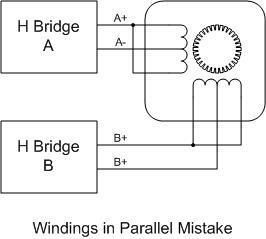 What if instead of ignoring half of the winding we connect both winding in parallel? Shouldn’t we gain from reduced inductance and resistance? YEAH BABY!!! Lets do it! OK, Sorry to burst your bubble, but this is not going to work. Due to the mutual inductance what will actually happen is that one magnetic field will cancel the other and the motor will never move. But just so that you feel better, I did make this mistake once. If we want to take on the advantage of a parallel connected winding we will need the eight wire stepper. This posting is already too long, but I may study it in a future release. In the mean time, I do hope you are wired! for finding the right wires on a 5 lead unipolar stepper, is 4 led. Find the common wire as described in the text around figure 2. Solder all the long leg on the led together. Solder the common wire to the long legs. Solder 1 wire to etch free leg. We have a project for cars. -the speed can vary from 300rpm to 12000 rpm. -the same inertia. 16.10-6 kg.m2. -a movement of 1 degre in less than 10ms. Ideally 5ms. I am afraid it is hard for me to offer guidance on motor selection. Perhaps a motor supplier would be able to let you know whether any family member within their offering can meet your requirement. In some cases, and if volumes merit, they may even design the motor to your design requirements. Seems to me, though, what you are looking for is a 3 phase BLDC / PMSM for your 300 RPM to 12000 RPM motor (I assume 120,000 is a typo) and the one requiring motion in 1 degrees should most likely be a servo of some kind. Either stepper or 3 phase BLDC / PMSM should be able to operate in this fashion. I plan to write a tutorial on Servo implementations later this year. I am working in the hardware as we speak. Good luck on your search! Hi , how should I wire my stepper , if I have -5V and 12V ? Do you mean if all you have is a 12V and a -5V voltage source? That is not going to do a whole lot to power up a stepper, as you need a power stage to cause commutation. You could drive said power stage with the 12V, that’s for sure. There is a gazillion stepper drivers out there you could take a look at. TI, Toshiba, ST, Rohm, Allegro, and Trinamic are some of the names I would do a search on. You will most likely need a microcontroller as well, in order to provide the pulses required to command the stepping sequence. There is an even larger pool of solutions which would be used to do this, starting with Arduinos, Raspberri Pi’s, or your just favorite microcontroller. Good luck and have fun with your stepper endeavor!